Last week the Motherlode blog post about picky eaters got well over 200 comments. Obviously a sore spot and matter of concern at dinner tables across the country. 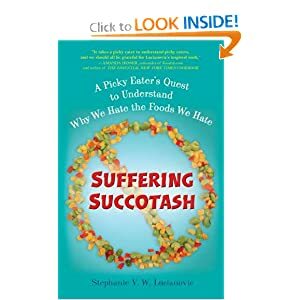 The post was written by Stephanie V. W. Lucianovic, a self-proclaimed childhood picky eater turned food-writer and author of the book SUFFERING SUCCOTASH; A Picky Eater’s Quest to Understand Why We Hate the Foods We Hate, published by Perigee Publishing, the same publisher who will be putting out my Slow Family Living book next March! The book delves into the plight of the picky eater. Lucianovic takes her questions into labs and the inner sanctums of feeding clinics. She interviews “fellow picky eaters and adventurous foodies young and old.” And attempts to answer what it means to be a picky eater and what we can do about it. I’ll be giving a copy of this book away next week and will pick a winner on Tuesday, July 17th. If you’d like to be entered in the drawing, just leave a comment about your own picky eating days as a child or about your days of parenting a picky eater. Renee Trudeau is a local mama and author and a coach and advocate for balanced living. A few years ago she wrote a book called The Mother’s Guide to Self Renewal for helping mothers reconnect with themselves. For 48 hours on and before Mother’s Day she is offering the book as a free download so get on over there and get yourself one. Or tell a new mom you know. What mama do you know doesn’t need a little self-renewal? We did it! We did it! We are super excited to have our two new workbooks up and available for download. We’ve been working on them for a while now and they are ready for your perusal. Thanks to Jenny Medford for helping us figure out the technical side of things and making the download process seamless. The Slow Family Living Workbook is yours free. Yes, you got that right. Free. Just go and get it Help us spread the word. It’s our gift for all of the help and input we’ve received helping us get clear on what tools we could create to help people define their own version of slow. The Family Mission Statement workbook will help you and your family determine who you are, why you entered family life in the first place and where you want to go from here. It is our hope that the questions in this booklet will help bring you and your family to a clear understanding of your desires, needs and values as a family unit – from which you can begin the process of allowing your own mission to unfold. And remember as you do the work in the books, there is no right way, only the way that feels right to you. You will not be tested but it will definitely behoove you to know it. Our book, My Book, is here! And it’s fantastic! It looks good. It feels good and we are happy to send it out into the world today. Hoo-rah folks!! We are so excited!!! Come and get your own copy. It will change the way you start each day!